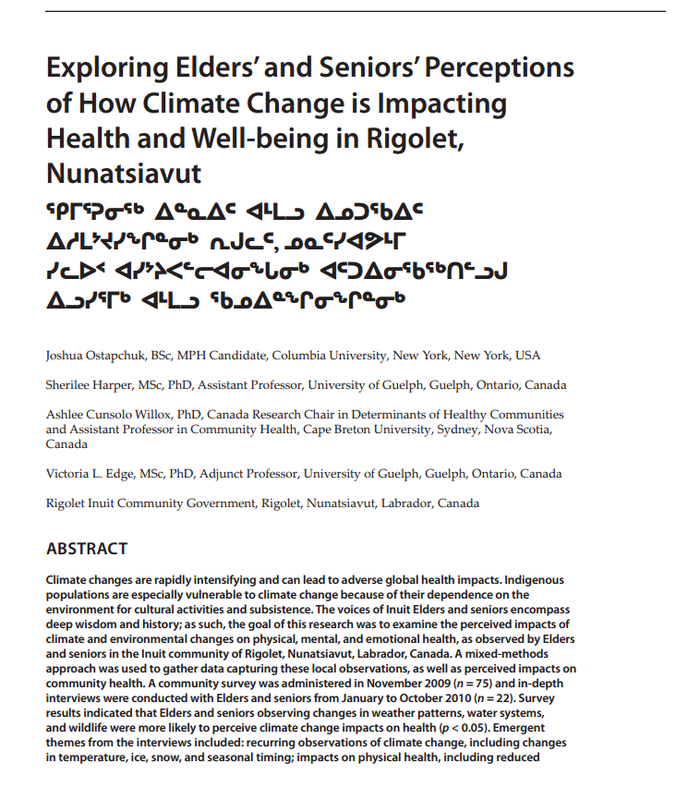 Our newly published article examines how Elders in Rigolet, Nunatsiavut observe, experience, and respond to climate change impacts on health. The article is published in the International Journal of Indigenous Health in a Special Issue on Inuit Health and Well-Being, and is freely available through Open Access. Congratulations to the first-author, Josh Ostapchuk! Josh did his fourth year thesis project with Drs. Cunsolo Willox, Edge, and Harper at the University of Guelph. He recently completed his MPH at Columbia University (NYC) in in May 2015, and accepted a full-time position with Deloitte in New York City as a Healthcare Strategy & Operations Consultant.